This dragonfly doesn’t perch like this for fun. His pose is a threat display. This is a male Common Whitetail (Plathemis lydia), a showy dragonfly with a white pruinose abdomen and clear black-striped wings. Common Whitetail males are highly territorial. They live near ponds, marshes and slow moving rivers where they defend 10 to 30 yards of the water’s edge and conspicuously chase away all other males. When they’re not chasing they pose like this to let the others know they mean business. Their white pruinose backs are the warning sign. Pruinose refers to the dusty, frosted appearance caused by a pigment that covers the insect’s “skin.” In nature, pale-colored pruinescence often reflects ultraviolet light. If so, this bug probably glows in sunlight. I wish I could see it! Female Common Whitetails look quite different because their tails aren’t white, a feature that probably protects them from male aggression. Watch near water and you’ll see the males patrolling. Try to find the females too, even though they’re not so flashy. I’m happy when I see them. 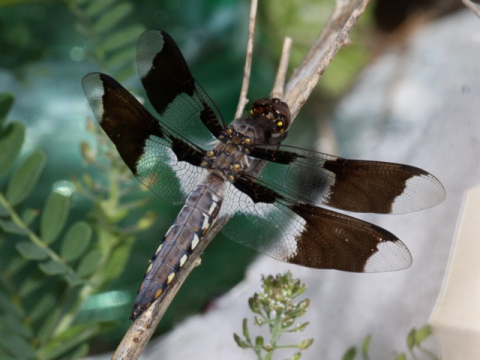 These dragonflies eat flying insects, including mosquitoes! See quite a few of these at Crooked Creek on both ponds. 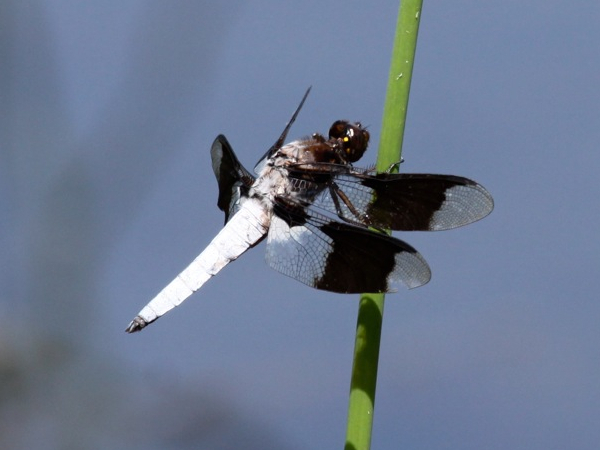 Also a few Pond Hawks and Spangled Dashers, and other neat Odonata…interesting article, Kate–thanks, I did not realize the reasoning for this “pose/perch”. I have seen the females and it their bodies resemble a dagger or lance or other weapon, in a way, in my opinion. I used to see one a lot last summer, patrolling by Schenley Park swimming pool. Maybe he thought it was a pond? near our very small pond. long slilm white body dark, (black) wings , the wings look like dadrk paddles as part of them are transparent…..???? Today I took half an hour to catch a few pictures of the male. It was beautiful while it roamed threw our vegetable gardens there is a huge saloo about half a mile west of us and a few small ponds about a mile north of us. I have a few of these outside my apartment. We have water features here so the water territory makes sense. They are so beautiful, that I finally looked them up, very cool!! Photos on this blog are used by permission and are copyrighted material. Click here for information on contributing photographers and the banner photo credits. Question: Why Doesn’t The Nest Have Sticks? Question: What roles do the parents play during incubation? Question: Is She Eating Rocks? Question: Why is this bird face down on her nest? Question: Why are the eggs red? Question: Why are her eyes white? Question: What roles do the parents play in raising the young? Question: Are the chicks getting enough to eat? Question: What happens to the leftovers? Question: Where are the Parents? Question: Did one of the babies fall from the nest? Question: The juveniles are a different color? For how long? Question: What is Ledge Walking? Question: Do they fledge all at once? Question: Where do young peregrines go when they leave home? Question: Why do the adults visit the nest after the babies are gone? Question: What happens as peregrines age? Question: How do peregrines get their names? Question: Why and how are peregrines banded? Question: What is a Peregrine Fledge Watch? Question: Where should I look to see the peregrines at Pitt?